A teenage boy attacked in a 'killer clown' prank has warned that people could die as the craze sweeps the country. Owen Russell, aged 17, was left covered in blood after a branch was thrown at him by a clown trying to terrorise people in Dinnington. The six form student, from Anston, said he was lucky not to have been killed or to have lost an eye in the attack. He said he and a group of his friends spotted the clown, who had a 'sinister laugh', on a path off Scarsdale Street on Tuesday night. When challenged by the teens as the clown approached them, the masked attacker walked off carrying a branch before turning round and hurling it at the group - hitting Owen on the side of his head, and leaving him with a V-shaped wound which needed stitches. "I felt my head and there was blood everywhere. I had to take my T-shirt off to try to stop it while my friends chased the clown, but he got away," said Owen. "He started to run once he realised he had hit me. He knew what he had done but he didn't stop. There was blood everywhere." Owen said he was lucky not to have been seriously injured or killed. "I could easily have lost an eye or been killed - this clown craze has to stop now, it's getting out of control. "I'd heard about clown sightings in other parts of the country but would never have expected it in Dinnington. It was a bit surreal and freaky when we fist saw the clown in the distance but then to deliberately hurt someone takes this craze a step too far. "People doing this to frighten people need to stop before somebody dies." On the same night there were reports of a clown chasing a group of children in Dinnington and earlier this week a pregnant woman and toddler were also reportedly chased. Reports have also been received of a clown armed with a baseball bat frightening people while driving around Wickersley with clown music blaring out of their car. Owen's dad, John Russell, said: "This clown thing has gone too far, it's getting ridiculous. It's pathetic, absolutely pathetic. "Owen was badly injured but it could have been so much worse. I was shocked when I saw him covered in blood. The branch just missed his eye by a matter of inches. "People dressing up as clowns and doing things like this need to stop now before it's too late." 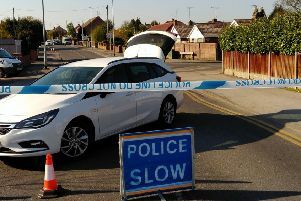 A police probe into the incident is underway.